Trent Alexander-Arnold has succinctly underlined how important the atmosphere at Anfield is to Liverpool’s hopes, after a backing they “needed” on Saturday. Before the weekend’s clash with Bournemouth, Jurgen Klopp backed supporters’ efforts to pack the stadium early and restore the ’12th man’ in the Reds’ title charge. The manager had urged fans to “shout their soul onto the pitch,” and was rewarded with a raucous showing from the Anfield faithful. Trent is a boyhood Red, raised in West Derby, who knows how much bringing a first Premier League title to Merseyside means to the city, and how difficult it has been in those fallow years since 1990. He made his return from an ankle injury in the second half of the 3-0 thrashing of Bournemouth on Saturday, and his assessment of the atmosphere was telling. “Hopefully the supporters saw one of the best performances of the season. We hardly put a foot wrong,” he told reporters. “I said to Jordan Henderson that I’d never seen Anfield like that at 3pm on Saturday. “The scarves, the flags, the banners: it was something that I hadn’t really experienced. Klopp has often referenced the difference in supporters for a night game, especially in the Champions League, and those on a weekend afternoon. This is due to a variety of factors, but given how close Liverpool are to securing silverware it should not be, and this is the point made in the buildup to the clash with Bournemouth. 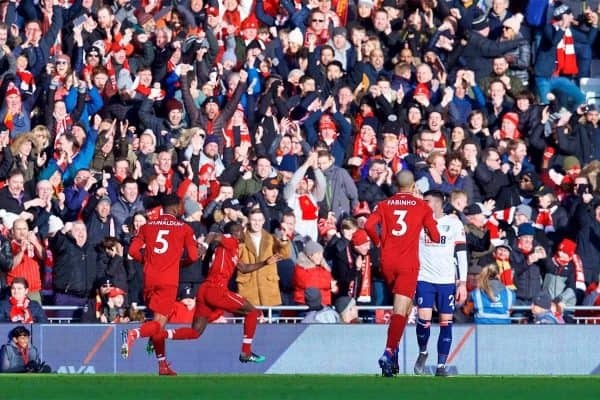 An anxiety, or restlessness, from the crowd can spread to the players, which was evident in the 1-1 draws with Leicester and West Ham, but so too can the positive aggression Klopp calls for. Trent is well positioned to acknowledge this, not just because his role as right-back often sees him closest to the stands, but due to his upbringing. Him stressing that Liverpool “needed this” to get back to winning ways at the weekend is paramount, and with victory in the remaining 12 league games guaranteeing the title, it is what should be expected every time.